Download a Gift Aid form here. Stacy Hart aka Rap/Hip Hop artist Mama Chill is an ME sufferer with real talent. When diagnosed with ME doctors told her that any chance of a music career was well and truly over but Stacy didn’t let it discourage her. While bed-bound for two years she released a 13-track home demo rap/hiphop album ‘RAW’ and also entered and won a competition to write a song for Victoria Beckham on Channel 4’s Richard and Judy. This positive feedback encouraged her back into the studio where she worked with producer Shane Shanahan on her next album ‘Nobody wants to know ya when ya Nobody’. Stacy dedicated a track on the album to raising awareness of M.E by covering the Ann Peebles original I Cant Stand Tha Rain and making it her own. All proceeds from downloads of the original album track I Cant Stand Tha Rain [Explicit] on the album Nobody Wants To Know Ya When Ya Nobody go to Invest in ME Research. Preview and download the original track on iTunes and Amazon. When interviewed on Vibe Radio September 2012 Stacy talked about having ME and her support for the Let’s Do It for ME campaign. I Cant Stand Tha Rain was one of three tracks played from her album. Also interviewed on BBC Introducing 19th October 2012, Stacy raised further awareness for Invest in ME Research and the proposed Centre of Excellence for ME. Presenter Nia Visser posted photos on Twitter, March 17th 2013 – Tweet 1, Tweet 2 – of herself (right) and Nancy Hatcher opening a thank you parcel from Invest in ME Research and sporting their awareness bracelets. They played I Can’t Stand Tha Rain, as they continued to do, and spoke about the charity’s biomedical research and how ME is a misunderstood illness. Mama Chill’s second ME Awareness track Dont Say Nuthin If It Ain’t Worthwhile debuted on Watford’s Vibe 107.6 May 5th 2013 and despite it being a struggle Stacy made it in to the studio to promote the track. In July 2014 Mama Chill was listed in an article by Erica Verrillo on ProHealth 10 Celebrities with ME/CFS. You can read more about Mama Chill and M.E here. In December 2013 Stacy started teaching herself graphic design to create unique t-shirts and other merchandise that can be worn by anyone and everyone and to raise money for charity. In light of the success of the design known as “Runnin On Empty” she then worked hard, despite poor health, to create more designs, available at her online charity store: Mama Chill. 50% of profit is donated to Invest In ME Research. The other 50% goes to local charities and good causes. 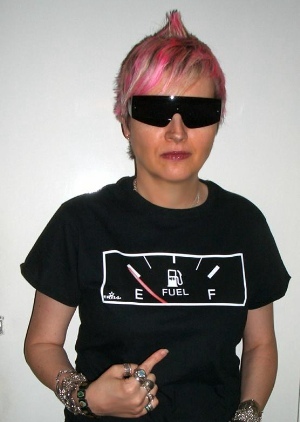 Check out Stacy’s excellent pages for awareness: on her Official Runnin On Empty website. Free to download from this page on Offical Runnin On Empty. With thanks to Mama Chill, Nia Visser & Nancy Hatcher for their help in raising awareness. Let's Do It for ME is a patient-driven campaign to raise awareness of and vital funds for Invest in ME Research, a small UK charity with a Big Cause. Together, and with your help, we aim to establish a national strategy of biomedical research into myalgic encephalomyelitis (ME) and a Centre of Excellence for translational biomedical research into the disease at the University of East Anglia. Our ultimate goal is for the findings of high quality research to result in a better understanding of the underlying pathology and in the development of appropriate treatments.